With their imagination, skill and aesthetic perfection, the designs of Mayan artists shown here give a general idea of their enormous artistic and cultural potential. 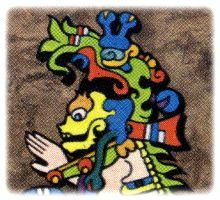 Mayan glyphs and artistic representations have been incorporated into the cards which also maintain the familiar numerical characteristics of Anglo-American playing cards. In addition to the Arabic numbering, each card also contains the Mayan equivalent of playing card suits and simple Mayan numbering. The set includes a multi-lingual leaflet published by Mundo Maya / Creaciones Artesanales del Sureste and a booklet describing the history of the Mayas, inside a specially made artesanal box. 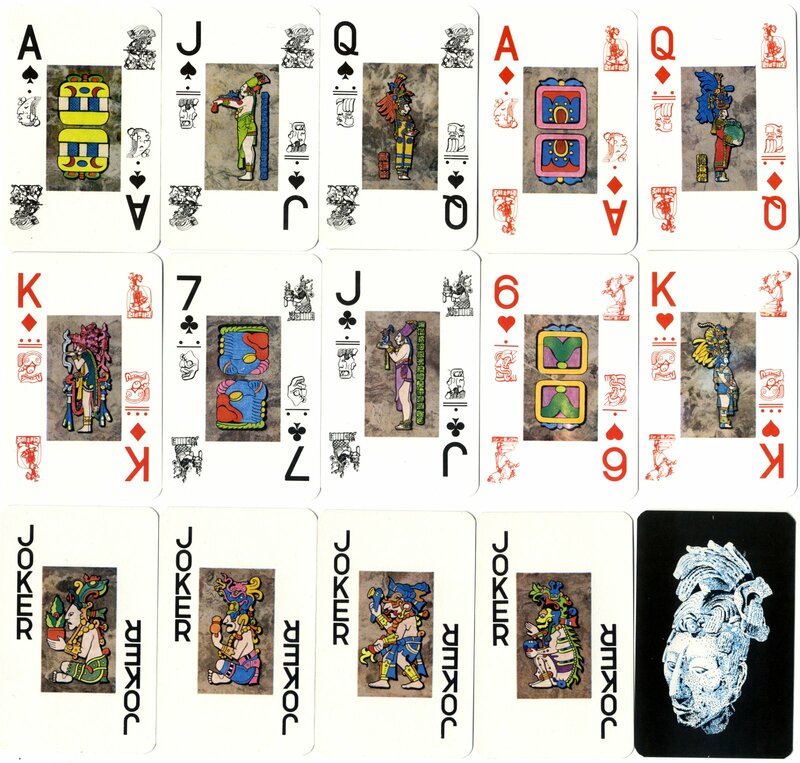 Above: Maya Playing Cards ('Naipe Tipo Maya') manufactured in Mexico by Pronaco S.A. de C.V., Georgia 167 Col Napoles Mexico 03810 D.F. 1991. Using a bark paper background (Amate) the central space area of each card has been used to place the hieroglyphics or images corresponding to days, months, gods or important characters. The back design represents a stucco piece forming part of a death offering discovered in the tomb located inside the pyramid known as 'The Temple of the Inscriptions" at Palenque, Chiapas.